The arraignment was routine. In a ritual as familiar to him as the catechism, Dan introduced himself as counsel for the defendant, waived reading of the complaint, and entered a plea of not guilty on behalf of his esteemed client, Carson Romero. Carson, for his part, seemed genuinely chastened from the Riot Act Dan had read him last night. Whether Carson’s performance is worthy of an Oscar remains to be seen. Given the seriousness of the charges and the client’s ability to make bail, there was no point trying to suggest to the Hon. ‘Hang-Em High’ Hanrahan less bail than the $2500 already set. Discretion being the better part of valor, Dan let that stand without a fuss; and he set a pretrial conference date of Jan. 6 so that the Romeros could mercifully get through the holidays before having to deal with their son’s mess again. When Joe Romero’s first call came in Dan thought this file would have all the excitement and glamor of a run-of-the-mill auto wreck case. Now he finds himself wading knee-deep into a complex web of criminal and civil actions. His file opened, fee agreements in place, and his most trusted associate, Mr. Green, now on the case, Dan needs to quickly get his bearings and start plotting a course for straightening out this skein of legal trouble for his clients. With its powerful organizing, searching, sorting and mind-mapping capabilities, Summary Judgment is the right navigational tool for the dead reckoning Dan must do. 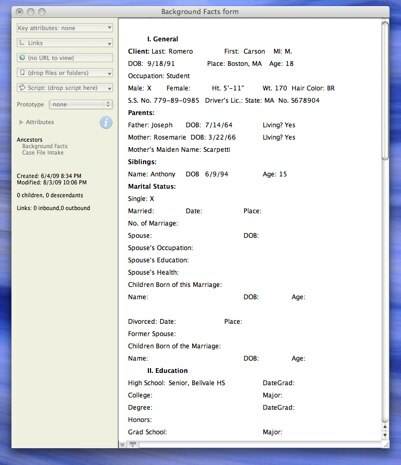 He puts it right to work in taking down the background facts and occurrence facts using the comprehensive intake forms provided in the Case Intake section of the SJ outline. In the next post we’ll see how Dan uses all of the investigation information he has gathered and organized in SJ to get a fix on where he is, and proper course headings to the next waypoints. Copyright © 2009 Stephen M. Winnick, Esq. All rights reserved. Dan got back from court after 5 p.m. tired, hungry and with a splitting headache. The note from his office manager, Tom Barron, was no aspirin. Carson Romero was arrested by Officer Woodson in the afternoon while Dan was in court. 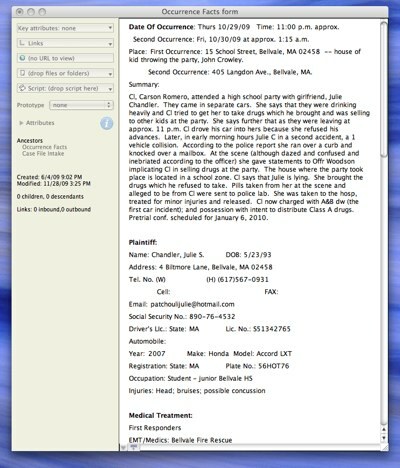 He was charged with A&B by means of a dangerous weapon, to wit: the automobile that he was accused of crashing into Julie’s car in the first incident; and worse still, with possession with intent to distribute a Class A substance within a school zone. He was booked at the Bellvale Police Station and released on $2500 cash bail which his father, Joe Romero posted. He left for home with his father and his mother, Rosemarie Romero, who was in tears. He is scheduled to be arraigned in Bellvale District Court in the a.m. According to Tom’s note, this squall line is moving to meet Dan at 5:30, about 15 minutes from now. Dan goes into the bathroom down the hall. He throws cold water on his face, combs his hair, and otherwise steels himself for what is certain to be a tough client conference, once the reality of what Carson is facing sets in. The office doorbell rings. Joe Romero and Rosemarie swoop in, not pausing for pleasantries. Carson, looking baleful, follows behind. Dan leads them to his conference room. “That’s fine so long as you get him out of this mess. I’ll write the retainer checks right now”, taking out his check book and writing the checks. Dan is really beat and wants only to get home for some dinner and a nightcap or two to take the edge off. After he gets back to the office from the arraignment tomorrow he will prepare fee agreements and transmittal letters to the clients using SJ’s forms (which include clear and concise flat fee, hourly, contingent and mixed fee agreements and transmittal letter forms). He will also prepare a joint representation disclosure and consent letter, which he will tailor to the specific facts of this case involving potential conflicts of interest between Joe Romero and his wife, Rosemarie, on the one hand, and Carson the son on the other. “Dan, pick up on 02”. “I’m glad, because you’ll find me to be a straight-shooter, at least within the bounds of my profession. “I was working a night detail on routine patrol in a black and white when I got a call over the radio around midnight. There was a car accident on Maplewood Street near the intersection with School. When I got there I saw that a blue, late model Honda Accord drove over the curb and crashed into a mailbox up on the sidewalk. The mailbox was knocked over and the car’s front end was damaged. There was a teenage girl behind the wheel. I went over to the driver’s side window and took a look at her. “There was a strong odor of alcohol coming from her breath, her speech was slurred and her eyes were glassy. I asked her to step out of the car but she was too unsteady to get out and just fell back into her seat. She was too drunk to perform any field sobriety tests. ” I called for the EMT’s to take her to Bellvale Hospital. I bagged up the pills in an evidence bag and had them shipped out to the police lab. Before the EMT’s arrived I got the girl to sign a consent form to have blood alcohol and drug testing done at the hospital. When I got there I told the hospital E.R. guys to take blood samples and have them tested. “As a matter of fact I did. The next morning before I could call him to see what he had to say, he called me. He has no time now to digest everything he just learned from Woodson before he has to finish grinding out the motion to suppress on the Carrington case and get to court by 2 p.m. But he jots down a few thoughts and issues in a separate note filed under the “Notes to File” section of SJ. That way he can quickly get back to what needs to be thought-through and dealt with on Romero when he returns to the office. When he figures things out, he can move this note where the information properly belongs in the SJ outline . He can accomplish that easily in a number of different ways (e.g., by clicking and dragging the note to another section of the SJ outline; or by copying and pasting the text of the note into a new or different note in another section of the outline; by creating a duplicate copy of the note and moving it to the other/new location; or by creating an “alias” of the note (i.e., a special kind of copy which will automatically reflect any changes made to the original note and vice-versa), and inserting the alias in the other/new location of the outline. Dan calls Officer Woodson of the Bellvale Police to get his side of what happened. He doesn’t get through to Woodson but speaks with the desk sergeant, Fred Lawn, who is familiar with the case facts. 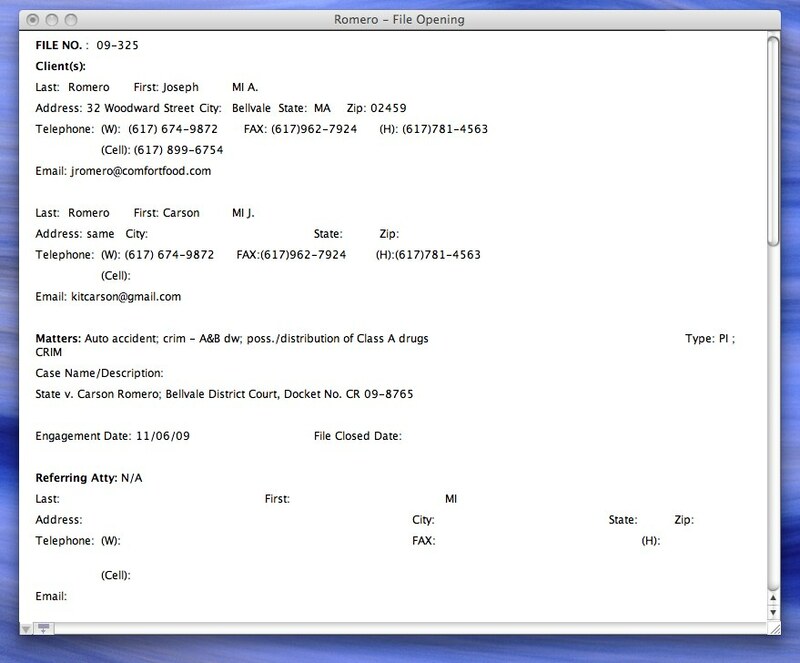 Dan uses SJ’s simple telephone call entry form in the Communications – Opposing Party subfile to make a note of that call. From his conversation with Sgt.Lawn Dan has learned a few things that spell more trouble. After Carson Romero hit her car Julie had a second car accident, a single car collision. Woodson responded and investigated this accident also. At the scene Julie appeared dazed and confused. Was this due to intoxication or her injuries? Dan can only surmise. The girl was taken to Bellvale hospital and treated for minor injuries, so the first choice — intoxication — is more likely. The plot sickens. Pills were found on the front seat of the car which have been sent out to the police lab for testing. No way of knowing yet whether they were prescription or illegal. And in the same inebriated breath Julie tells Woodson that Carson had crashed into her earlier in the first accident. What does Dan do after the call to the Bellvale police? He makes a time slip for his telephone call to the police. Dan will not charge for the initial phone call from Joe Romero, and as a courtesy to Joe, a valued existing client, he will not charge for this phone call to the police if he does not get retained to represent Joe or Carson. But if he is hired he will bill for the second call. So he fills out a time slip using the simple entry form in the Time & Billing section of SJ, which automatically calculates the amount charged based on the time spent and Dan’s billing rate. When it comes time to bill Joe Romero the SJ Invoice template will pull down and add this time slip along with all the others that have been entered by Dan, as well as any expense slips for Out of Pocket Expenses incurred on the file; and it will deduct any slips for payments and credits to which Joe Romero is entitled; and then finally it will render an easy to read and understand professional bill that can be mailed directly out to the client; or the time & billing data can be exported to a full-featured accounting program like Quickbooks™ for accounting and billing there. What is the lawyer thinking? Julie was probably drunk or under the influence of drugs when the second accident (single car collision) occurred. Depending on how she got the alcohol and/or the drugs this may raise more trouble for Carson. Dan thinks briefly about the potential for Carson’s probable negligence in the first accident creating civil liability for Joe based on some theory of negligent parental supervision. But he reasons that the risks of that are small because Julie’s injuries appear to be minor and are likely covered by auto insurance, either under Carson’s bodily injury coverage, or under a policy owned by Joe Romero which applies to Carson’s vehicle as a member of Joe’s household who is listed as an insured on the policy as well as a driver. Nevertheless these insurance facts have to be pinned down and Dan will put them in his TO DO list. Regarding Julie’s second accident, it may be possible that there is a causal connection from her injuries in the first accident for which Carson may be held liable. But the same insurance considerations apply so Dan is not terribly concerned about that. The pills found on the front seat of Julie’s car are another matter. Dan knows he has to speak directly to Woodson about where all of this may be heading. When we last left Dan he had quite a stew of facts and legal issues to consider, both civil and criminal. Because of their longstanding attorney- client relationship Joe Romero considers Dan to be “on the case” now; and, he is expecting that Dan will take care of time-sensitive matters needed for Joe and Carson’s protection, even though Dan hasn’t met yet with Joe or Carson to discuss the facts, and hasn’t been officially retained. Some of the issues raised may pose serious risks of legal malpractice if ignored, even if Dan is not hired. So Dan enters additional TO DO’s (e.g., to call Officer Woodson to get his side of the story; to arrange a client conference with Joe and Carson; to get Carson’s car inspected by the insurance adjuster; and to get the police report of the accident), hoping against hope that Mr. Green will arrive soon and he will not be stiffed for his work. And because the TO DO’s and subtask TO DO’s are tied to Tickler Alerts, Dan is confident that he will have multiple reminders to follow up on them and not miss any important deadlines. When we left off Dan had flagged a number of personal injury and property damage claims and liabilities that might result to the Romero family from the first auto accident. But much more troubling to Dan is the prospect of criminal liability if the accident was alcohol related. The cops (Grant Woodson of the Bellvale Police) have already called Carson wanting to speak with him. If Carson and Julie are high school teenagers they are almost certainly underage for purchasing, possessing or consuming alcohol. If an adult furnished the alcohol at the party there could be issues of social host liability. If the alcohol was bought at a liquor store there could be dram shop claims against the store. But at this juncture neither Carson nor Julie appear to be seriously injured, so these are not major considerations for Dan. However, if there is a criminal investigation into how the teenagers obtained the alcohol, and whether it was connected to the accident (which will be presumed by the authorities), then criminal charges may follow [e.g., Driving Under the Influence (DUI) or Driving While Intoxicated (DWI)]. Because Dan is an experienced litigator with both criminal and civil trial experience he is sensitive to the attorney – client issues raised between Joe the dad and Carson the son. Most probably Joe the dad will be paying for all of Dan’s legal work. But regardless of who pays, if Carson the son is above the age of majority (e.g., 18), then Carson will certainly be Dan’s “client” for the most serious issues raised by the case facts, both civil and criminal. Even if Carson is a minor he will be considered Dan’s “client” for the potential juvenile criminal matters. The issues of attorney-client privilege have to be carefully thought through, because the privilege can be lost if there is a third party present when the lawyer meets with his “client”. Just to make sure Dan makes a note not to interview Carson about the accident facts in the presence of Joe. What does Dan do with these initial case facts and impressions? 3. In Notes to File for pieces of information he can’t yet fathom until he can figure them out and put them where they belong. 4. In the Work Product subfile for putting down his mental impressions, ideas and strategies. Until Dan’s most trusted associate “Mr. Green” arrives (i.e., his retainer for legal fees is paid) he will not plunge into the case investigation; but he might make a preliminary call to the police to get their side of it until he can meet in person with Joe Romero and Carson. Dan uses the easy Tasks TO DO section of the SJ outline to record that he should call the police. And he enters another TO DO to call Joe Romero and Carson to set up a conference with both of them. He notes in this TO DO that he should make sure to interview Carson separately about the occurrence facts. The initial call comes in from Joe Romero, an established business client of atty Dan Hosmer. Because Dan is meticulous about documenting everything relevant to his case files, he records (i.e., makes a file telephone note ) of the call from Mr. Romero and the substance of the conversation. He does this in the Communications subfile of the SJ outline, which provides quick and easy entry forms for typical case file communications (e.g., telephone calls; telephone conferences; correspondence –letters, faxes, memos, emails, etc.). The Communications subfile is further subdivided into communications with client; opposing parties and attorneys; and third parties. Additional subfile categories can be easily added if required. The auto accident occurred at night after a high school party. Was liquor involved? If so there are multiple legal issues raised, both civil and criminal. Although it is reported that neither Carson nor Julie were injured it may come to pass that one or both may develop soft tissue, concussion or other injuries that were not apparent at the scene. Those injuries could give rise to civil actions for personal injuries based on auto negligence, and/or “no fault” claims under the Personal Injury Protection (PIP) portion of their respective auto insurance coverages. There is significant property damage to Carson’s vehicle, and presumably to Julie’s as well, even though she was able to drive away in her car. So there will be property damage insurance claims at a minimum. You are currently browsing the Winvictus's Summary Judgment™ blog archives for November, 2009.